Disclaimer: I am not a bad person. Sometimes bad things are done by good people. It all began with the window cleaner. No, I tell a lie. It all began when my daughter stripped back the ivy on the exterior wall of my bathroom. “There’s a wasps’ nest in here!” she said, beating a hasty retreat down the ladder and pointing to the ventilation panel at the top of the wall. “They’ve built it inside the bathroom loft, by the look of it.” A bit of a clue had been the preponderance of wasps annoying us while we’d sat drinking tea earlier. It was a sunny day, and I felt benign towards the wasps as long as they didn’t get too territorial. Having moved far beyond the ruthless arrogance of youth I am now inclined to carry small insects outside in my cupped hands, or if they are really creepy, in a container fit for purpose. I believe in the sanctity of all life and think of myself as a pacifist. A week later I contacted a local window cleaner – an admission of defeat, because I’ve always cleaned my own windows until the last couple of years when it’s got progressively physically more of a challenge. There comes a point when you just have to admit defeat about a number of things. He came round to case the joint, to ensure he could get his ladder through to the back of my small terraced cottage, and as he stood there in the garden surveying the upstairs windows he said: “Did you realise you’ve got two wasps’ nests out here?” He’d spotted a second one, up in the eaves above my bedroom window. That made even more sense of what was fast becoming a wasp incursion into my erstwhile peaceful, secluded garden. I didn’t really think it through. ‘Getting rid of them’ seemed like the ultimate solution at that point. I didn’t consider what that really meant for the wasps. I didn’t dwell overlong on how bad it was for the environment (not to mention the wasps themselves) as I purchased the means of chemical warfare the following day. I was mainly thinking of how great it would be to see through my windows again and sit in my garden without being bombarded by unwelcome buzzing visitors. Bees are different. I love the bees. They aren’t a bit of trouble. In fact I’ve planted everything with bees in mind and love the sight of a few bees bumbling away gathering nectar. I know I’m not on the witness stand here, but I don’t want to give the impression I’m a merciless, insect hating tyrant. Anyway, cut to the day the window cleaner arrived to do his thing. He was very thorough. Having restored my window panes to a state of splendiferous visibility I’d thought never to see again, he sprayed the bejasus out of the two wasps’ nests. Understandably, this infuriated and disturbed them into a frenzied, chaotic mob. Watching them cluster round the blocked entrance to their nest in the eaves made me feel so guilty, like I’d nuked Syria. It was all too horribly late to reverse my lethal decision. My tendency to anthromorphosise kicked in and I started fretting about the wasps trapped inside the blocked nest and imagined the desperation of those trying to get through the chemical barrier in the war zone to take care of their family. I could almost hear their screams. “They’re only wasps,” the window cleaner said, noticing my angst. Nice man, but clearly not on my empathic wavelength. He took his ladder round the corner to deal with the other nest tucked behind the ventilation grille in the mini loft space over the single storey bathroom extension. I withdrew like the coward I was into the kitchen and left him to it. I could have said: “Don’t bother. There has been enough slaughter for one day.” But I didn’t. I take full responsibility for that. I was no innocent in this. I was fully culpable. I really can’t blame the window cleaner. Unfortunately the ensuing events turned out to be something of a Waspgate. An hour after he’d gone I went into the bathroom to discover a scenario not unlike the movie The Birds, only with wasps. One of my worst nightmares. Too much of anything flying round your head is bad news. Thoughts being a case in point. 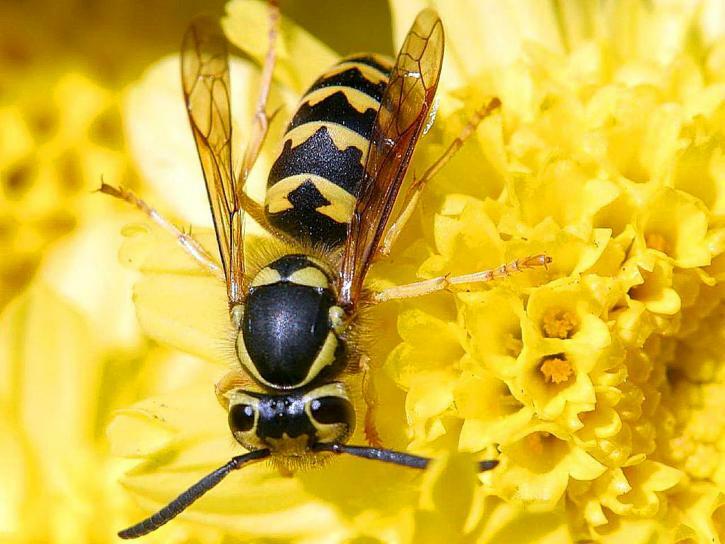 But although thoughts can be managed with mindfulness, the same isn’t true of wasps. There were what appeared to be hundreds of them, swarming in understandable panic and confusion. They must have escaped from the loft space via some minute cracks in the sides of the access hatch. It was total Waspageddon. I dashed back to the kitchen and got the now almost empty can of wasp nest destroyer spray foam, and dodging wasp bullets I sprayed all round the hatch, but by then they had followed me back to the kitchen so I was surrounded on both fronts. I started spraying the foam randomly, contrary to the instructions on the can which urged caution and the wearing of a mask and protective clothing. Afterwards both rooms and the lobby in between needed a thorough health and safety clean up. The wasps persisted. Eventually in desperation I got out the vacuum cleaner and started sucking them into it. Not easy with a hundred or so moving targets, especially when you feel forced by fear into the role of murderer, hating every second of the tactic you are using. It probably wasn’t them or me, but in the moment it seemed to be. When I say ‘moment’ I actually mean several hours, because the wasps just didn’t give up. And who could blame them? All in all, it was a bit of a debacle. Early next morning, when I went down to make myself a cup of tea, there was a small angry contingent of them in the kitchen, having been waiting all night to dive bomb me the moment I opened the door. Grabbing the almost empty can, I began spraying foam randomly again, which of course subsequently meant another health and safety clean up. That wasn’t the end of it by any means. For the next five days small gangs of them continued to manifest in the bathroom, albeit in ever decreasing numbers. I eventually concluded they were getting in from another dimension as by then I’d blocked, foam sprayed and basically turned my bathroom into a razed post nuclear ground zero for wasps. My extreme feelings of guilt escalated and I apologised (seriously) each time I picked them off and assigned them to wherever wasps go when they cross the rainbow bridge. Finally one of them actually stung me, as I was attempting kindly to give it a fighting chance by putting it outside through the cautiously opened window. Well, it had to happen. Be sure your sins will sooner or later come back and bite you. Two weeks on, and they are still coming in from somewhere – one intrepid rebel at a time. In a funny way I admire them. I can relate to their tenacity. And on the plus side, my bathroom has never been cleaner.